Gosh. I wrote this and scheduled it to post well before the hurricane. As I watched the devastation unfold, I considered removing it from the blog's queue. I gave considerable thought to this. I still don't know how the memorial fared. Anyway, ultimately, I decided to document this beautiful work of art here. I hope through this post I can find out how the work made it through the hurricane. I hope I can also restore some joy to Houston and spread some love for Houston to the rest of the world. Feel the love, and read on. I wrote about this for Arts and Activities and reposted on Party in the Art Room. I also really love Jesus Morales. So happy to have finally seen this in real life! We recently visited Houston, TX (because this is the way we ball...bonus points if you know about that? ), and I suggested we visit the memorial. My husband asked me why I chose that as the work to use for the column and why I chose Morales in the first place. Those two questions made me reflect a bit. I chose Morales because he had recently passed away at the time I was writing (not the time of publication). I mention in the other blog post about that Amazing Art Adventures episode. That is another reason I chose him. That video, old as it is, is a real favorite of mine. My students always really like it. I think it has something to do with the passion and gentleness he conveys as he speaks about his work. It is probably also because of the materials he is using. It is pretty fascinating. I chose that work because I think it is his masterpiece. It is incredibly complex in design and a major feat in my opinion. Having never seen it in person at the time I wrote the column didn't hinder me from being able to see the complexity in photographs. It is very hard to photograph. It is difficult to capture the depth of what is happening there. It is a little like a labyrinth, where you get get lost in the lines of movement. It is angular, though. Most labyrinths are circular. When I walked up to it, I was looking down. there were no steps downward from the path that leads to it. I had to look down to look for steps. 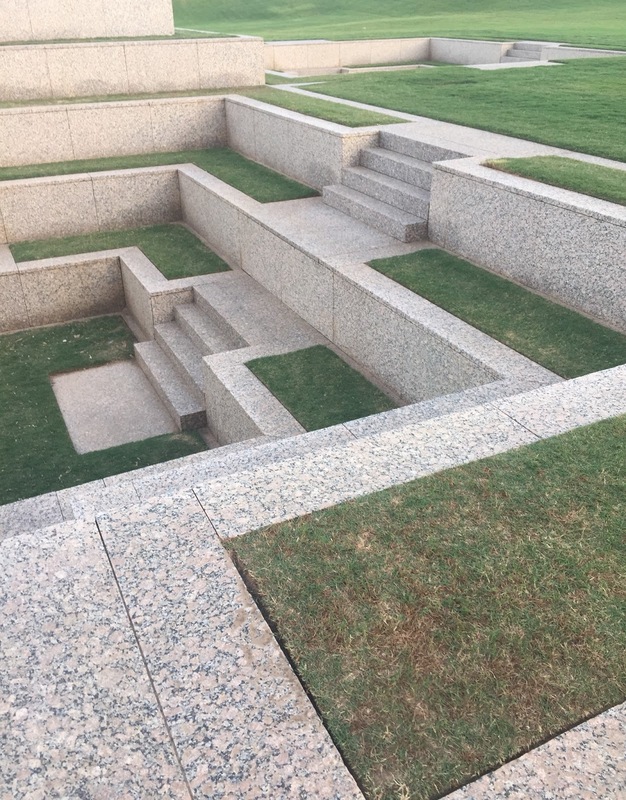 There were steps on the other sides, but not the entrance side. I think he wanted to force us to move around the memorial. I think this is because if the people just walked right up and went right down steps that were right there, it would be like walking into any other place. You have to pay attention. You are expecting steps to be there. They aren't. So, you look down and your eyes have to follow the paths around the sculpture. Then, you have to move your body. This has got to be a little like defending the public. You expect one thing and something else happens. You have to use your senses to tell you body to act. The unexpected aspect to this work is what makes it a masterpiece. I hope you get to experience this one day! I really truly do. If you are ever in Houston, make a point to go by. There is a walking trail and sculpture garden in the park with the memorial that you can also enjoy. Speaking of labyrinths, read this. It is interesting. I Googled "labyrinth" as I was writing because I wasn't sure that was the word I wanted to use.